JBL Mopani Root Large 30-40cm. 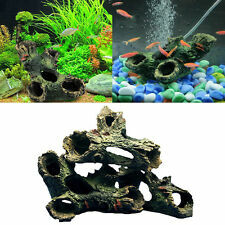 Perfect for aquaria use- due to weight will not usually float (unlike driftwood which can take several months to sink). Root shown is representative of root sent, not actual piece. Enhance your Aquarium, Fish Tank, Vivarium or Terrarium with these Bogwood (Driftwood / Tree Root) pieces as well as providing useful hiding places for your fish to breed or simply for shy and baby fish to hide. Enhance your Aquarium, Fish Tank, Vivarium or Terrarium with these Bogwood (Driftwood / Tree Root) pieces as well as providing useful hiding places for your fish to breed or simply for shy and baby fish to hide. Size: A) 26cm long x 8cm wide x 4cm high B) 24cm long x 10cm wide x 8cm high Weight: A: 270g B: 305g Please see our other listings as we have a selection of other bogwood pieces for sale. Perfect for aquaria use- due to weight will not usually float (unlike driftwood which can take several months to sink). Root shown is representative of root sent, not actual piece. As this is a natural product, of course individual pieces vary. Help create a naturallo oking aquarium filled with authentic rock, wood and plants. Can be added to the tank as is, or tie moss and/or java fern to the branches. The wood is ready for your aquarium. Saltwater, freshwater & Vivarium safe. Ocean Bed Driftwood. We w ill do everything in our powers to sort out any problems that may arise. If we don’t know the problem we can’t put it right. Give us the chance to correct it! 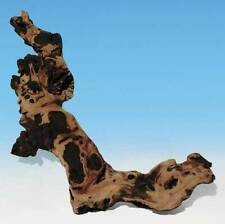 JBL Mopani Root Small 10-27cm. Perfect for aquaria use- due to weight will not usually float (unlike driftwood which can take several months to sink). Root shown is representative of root sent, not actual piece. Indian Almond Catappa Leaves. Indian Almond, also known as Ketapang or Catappa leaves, are becoming very popular amongst fish keepers/breeders around the world. They also provide natural cover. Ideal for shrimp, betta and discus tanks. Change your aquarium into a beautiful scenery. 3x resin Aquarium Decoration. It is vividly and color detailed to add lively and natural life to your tank. Use small thread to bundle the moss on the product constitute a nature living. Tree Stump Fish Cave with Moss. Tree Stump Cave with Moss. Brings personality, charm and interest to the underwater world in your aquarium. We w ill do everything in our powers to sort out any problems that may arise. This cholla was collected from Southern Nevada in a natural (no chemicals used in the area, etc) area. It has not been treated in any way. We do dust off loose dirt/debris and cut off sections that are too brittle. 4 inch Cholla Cactus Wood Chinchilla Chews, shrimps, fishtank. Condition is New. Price is per peice. You will recieve one random piece of Cholla wood. 4 inches in length and between 20-39g in weight Please message me if you gave a preferred weight bracket and i will do my best to accommodate. Whilst this Mopani wood has been cleaned and sand blasted we suggest it is thoroughly soaked before placing on your aquarium. Approx 20cm long. 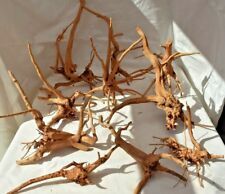 8 inch Cholla Cactus Wood Chinchilla Chews, shrimps, fishtank. Condition is New. Price is per peice. You will recieve one random piece of Cholla wood. 8 inches in length and between 10-39g in weight Please message me if you have a preferred weight. Otherwise a random piece will be sent from the selection pictured. We realize that only certain types of wood are suitable for aquarium use. All of our roots are sourced from specific types of bogwood which can be safely used in aquariums. - beneficial for the aquarium water properties, the fish and invertebrates. Iwagumi sets. The Red Moor Wood is a perfect natural decoration for any aquarium, vivarium, terrarium! -non-toxic -very good for growing java fern, java moss and plants in general. 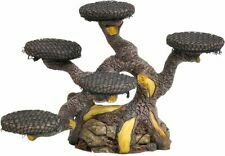 It can be set in different ways to create an ideal landscape in your aquarium/vivarium/terrarium. Chunky Driftwood Hideaway. Reptile Hideaway. A great place for your fish to hide and explore. Fish Tank Cave. We w ill do everything in our powers to sort out any problems that may arise. If we don’t know the problem we can’t put it right. Perfect for aquascaping your aquarium. To remove tannins you should soak the wood for 24-72 hours in a large bucket full of water. Using hot water will remove the tannins quicker than cold water. This will lessen any risk of potential aquarium water discolouration. 13 x 18 x 25 cms aquarium & Vivarium. Aquarium Foods. Aquarium Plants. Aquarium Accessories. Aquarium Shells & Barnacles. Aquarium Pebbles. Aquarium Real Bog & Curio Wood. Waterlife Aquarium Products. Can be stood up laid down or stuck on an angle to crete a eye catching decorations to your tank! ALSO SUITABLE FOR REPTILE'S TANKS. ALSO SUITABLE FOR REPTILE TANK VIVARIUMS andTERRARIUMS. This wood needs to be soaked in a bucket before placing in your aquarium! Vivarium decoration. Tree Stump with Moss. Tree stump with moss. aquarium centre piece decoration. We w ill do everything in our powers to sort out any problems that may arise. If we don’t know the problem we can’t put it right. We are here to help and will resolve any issues. 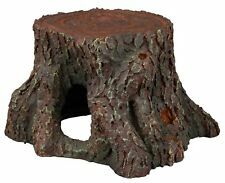 Here we have a small root stump with Plants that is suitable for all aquarium fish. This large stump is designed so that fish can swim through and around this item and servers as a focal point inside the aquarium. If you have problems keeping waterlogged root in place then nylon cord can be used to tie the root to a stone or slate (inert) in order to make the wood stay down. Vines can be used also in vivariums, terrariums. Safe made material, no harm for fishes and other reptiles underwater;. Type: plastic plant. - A lively imitated raising river, providing good sheltering and playing area for fish;. - Fun for fish and water animals to crawl and swim around;.